For 16 years the mile relay record of 4:16.1 was held by the 1980 team of Margaret Scott, Pam Pendleton, Kathy Nicolls and Teta Murphy. When CHS changed their records to metric equivalents the 4x400 record converted to 4:14.6. 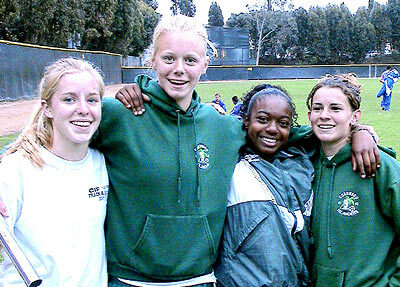 Photo from left: freshmen Samantha Piper, Jennifer Robbins, Christine Hansen, senior Jessica Lunt and then shot put record holder Vanessa Bowman. Piper, Robbins, Hansen, and Lunt broke the record set in 1980 (see above). In 1996 three fast freshmen came along and joined forces with our ace senior miler, Jessica Lunt, and started chasing the record. On the strength of a great anchor leg by Lunt they finally got it the last meet of the season at the CIF prelims by running 4:14.45 (automatic timing). This time was only .15 seconds faster than the old record and was run on Balboa's fast synthetic track as opposed the dirt track the original record was set on (Mt. Carmel). 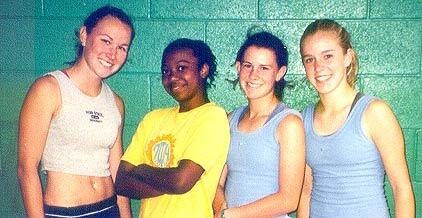 In 1997 another freshman (Kiley Dunlap) came along and the other three girls on the team were a little faster. This combination produced a time nearly identical to the 1996 record (4:14.40). Since the last two performances were so close and the 1980 record was run on dirt as well as being on a longer track I consider all of the performances prior to the 1999 standard of 4:12.70 to be equal. and the girls 800 meter record. 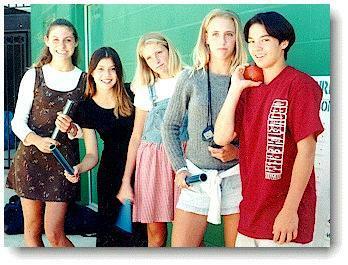 (L-R in the photo) at the 1999 Harbor League Finals. Dunlap led off followed by Taylor, Robbins and Piper. Both Piper and Robbins were on the team that broke the 1980 mark in 1996 and again in 1997 (see below). Dunlap and Taylor are also on the record board as members of the 400 meter relay record team, also set in 1999. Piper holds the 400 meter record, and until 2017 then 800 meter record and was selected as the CIF Female Top Scholastic Athlete in California for 1999. 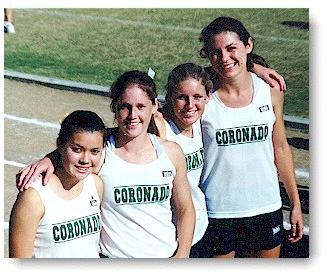 After a year of relative obscurity the girls track team got a boost in 2001 from three fast freshmen, Beth Wittry, Nila Heurtelou and Katherine Wingert, who teamed up with senior Lani Kuhlow at the CIF finals to knock over 2 seconds off the girls 4 x 400 record with a time of 4:10.29. To be accurate, they broke their own record of 4:12.2 set the previous week at the CIF Prelims. The record prior to that was 4:12.70 set in 1999 by Jennifer Robbins, Kiley Dunlap, Kathleen Taylor and Samantha Piper. Kuhlow, her freshman sister Janel, Heurtelou and Wittry nearly broke the 4 x 100 record at both the prelims and finals, missing it by 1/100th of a second at the prelims running 50.92 automatic time. Lani was a part of that record of 50.91 in 1999. She also set the 100 meter high hurdle record in 2001. In 2002 the void left by Lani's graduating was filled by multi-sport freshman standout Jamie Klages. Although Jamie was primarily a high jumper and hurdler (she set school records in both of those events) she had enough speed/stamina to help lower the record to sub-4:10 for the first time. They ran 4:09.42 at the CIF prelims in 2002. Beth Wittry also broke the triple jump record for the first time with a jump of 32' 7"
Katherine Wingert, Jamie Klages, Nila Heurtelou, Beth Wittry.